Thumb MCP joint is stabilized by proper collateral ligaments, accessory collateral ligaments, the joint capsule, intrinsic musculature, and extrinsic tendons. A/P, lateral and oblique views of the thumb indicated. Dorsal thumb MCP dislocation: Closed reduction for dorsal dislocation: flex the wrist and the PIP joint to relax the flexor tendons. Apply pressure from dorsal to volar to the base of the proximal phalanx. 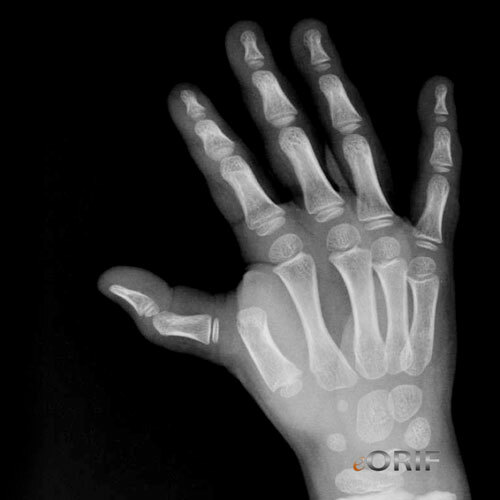 Volar thumb MCP joint dislocation: uncommon. often requires open reduction due to interposed tissue(EPL, EPB, dorsal capsule, volar plate). Closed reduction is generally unsuccessful if there is no palpable EPL, displacement of the EPL or EPB, interposed sesamoids on radiographs, and paradoxical MP joint flexion and interphalangeal joint extension on attempting MP extension. Closed reduction for volar dislocation: Wrist and MCP joint is flexed, and gentle pressure applied to the volar surface of the proximal phalanx as it is brought into extension. Early ROM with a dorsal blocking splint preventing extension beyond neutral.